It’s a retro, cassette-playing boombox! Fresher than the Prince of Bel Air! So, you’ve got a bunch of old tape albums, mix tapes, and cassettes featuring recordings of you pretending to be a radio DJ. And, you think that, like an ‘80s one-hit wonder, they’ll never reach human ears again? 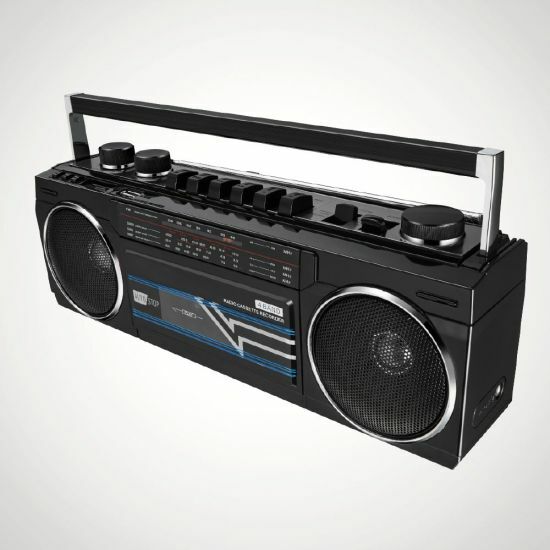 Well, thanks to this Bluetooth Cassette Boombox, they’re coming back like… well, tapes! Featuring a retro design that’s as ‘80s as neon baggy trousers, shoulder pads, and perms, this retro cassette boombox can play all of your old tapes. But, just in case you’re in the mood for a musician that isn’t hipster enough to release their music on cassette, you can also stream music directly to the boombox via Bluetooth! Oh, and it’ll let you play music off SD/MMC cards and USB, too! This boombox runs off mains power (and has a mains lead included). But, it can also run on 4 x D batteries, making it totally portable. So, feel free to load it with hip-hop, throw it on your shoulder, and walk with a limp down graffiti-covered alleys. Yeah, now that’s baller. You might not have a time-travelling DeLorean, but you can totally go back to the glory days of cassettes with this Retro Cassette Boombox! Order yours today!